Today, the Ka-27M helicopter flew over to its permanent stationing site at the Donskoye airfield, where its crew was met by the squadron command and the air unit personnel. The next step in training the helicopter pilots is to be fulfilling combat training tasks at the Baltic Sea’s training ranges. 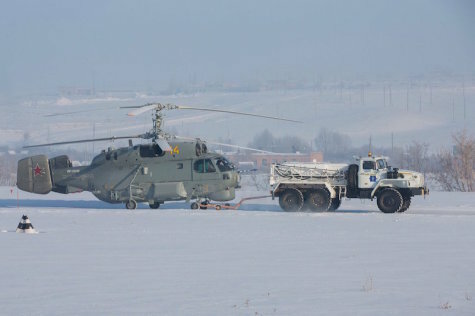 Last week, five updated Ka-27M helicopters arrived at one of the Kaliningrad Region’s airfields. Representatives of the industry and technical staff are currently conducting service works and seasonal maintenance of the updated rotorcrafts. Their onboard electronic equipment was modernised, new search system and radio acoustic equipment were also installed. All this together allows helicopter crews to significantly improve performing tasks on searching and detecting the enemy’s submarines. The helicopters were updated by specialists of the Kumertau Aviation Production Enterprise (Bashkiria), which is a part of the ‘Russian Helicopters’ holding. The goal of this modernisation is to improve the operational capabilities of copters, in particular, by means of transmitting information in real time both to ground and shipborne command posts, as well as to other helicopters. The Ka-27M is equipped with a new “radar command-and-tactical system”, including a new acoustic and magneto metric system, a radio reconnaissance system, an information computing system, and an onboard Kopyo radar station with an active phased antenna array.